One source, the Shadowlands Haunted Places Index, claimed that the ghost of a janitor haunts the Barlow Street School in the girls’ restroom located in the basement. He is said to have died there. 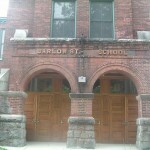 However, at StrangeUSA, another source, one reader commented that he/she had worked at the Barlow Street School when it was being used as a haunted house. Apparently, the man in charge of the haunted house would nail the window of this girls’ restroom shut with long nails each night. Then, he would discreetly return, remove the nails and pull the window open. He would make a big deal out of it for the actors in the haunted house, thus propogating the story that Barlow Street School is haunted. Interestingly, even though this story is not true, paranormal investigators have found some evidence of ghostly activities at this location. Windows open on their own. Some have reported seeing apparitions in the windows of the old Barlow Street School. Cold spots have been reported at this location. Disembodied foosteps and disembodied voices are commonly observed in the hallways. Some have reported seeing lights go on and off without explanation, as well. Actors working at the haunted house that was once located at the old Barlow Street School reported feeling as though someone had touched them when no one was around.